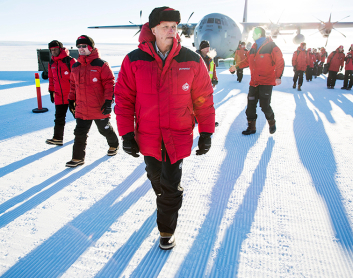 UPDATED: The frigid expanse of Antarctica glittered under blue skies and sunshine when Norway’s King Harald arrived this week to celebrate the 10th anniversary of his country’s Troll research station. As he flew into the area that bears the names of royal family members including his own, the monarch was often grinning from ear to ear. King Harald, who will celebrate his own 78th birthday next week, had mentioned the trip in his annual address to the nation on New Year’s Eve. While his wife Queen Sonja visited Troll and Antarctica back in 2005, he became the first monarch to ever set foot on the continent, following a nine-hour flight in a Hercules transport plane from Cape Town, South Africa. He’s accompanied by Justice Minister Anders Anundsen of the Progress Party and Environment Minister Tine Sundtoft of the Conservative Party, both of whom were likely relieved to get away from a variety of political challenges back home in Oslo. Anundsen has been under fire on several fronts, while Sundtoft has been accused of refusing to set goals for carbon emission cuts in Norway while allowing the oil industry to expand in the Arctic. They’re also along to celebrate the research station’s anniversary and learn more about Norwegian and international ice and climate research in one of the world’s usually most forbidding environments. Newspaper Aftenposten could nonetheless report how the weather was sunny on Tuesday evening with no wind at all and temperatures of just 10-12 degrees below the freezing point. Norway claimed territorial rights to what’s now called Dronning Maud Land (Queen Maud’s Land, named after King Harald’s grandmother) in 1939. Norwegian whaling fleets had already all but emptied the local seas of whales, while Norwegian Roald Amundsen had been the first to reach the South Pole. Norway’s annexation measure declared the area between 20 degrees west and 45 degrees east to be part of Norwegian territory. Only Great Britain recognized Norway’s claim, though, and in 1959, 12 counties agreed to set aside national claims, devote Antarctica to research and limit military activity. A total of 40 countries have since signed the agreement. So despite being on ground that features his own name (the Prince Harald Coast), the Norwegian monarch’s country has no sovereignty in Antarctica and he was just visiting. Today nearly all the Norwegian activity in Antarctica involves research, of the ice, birds, the air and the atmosphere. As with former Prime Minister Jens Stoltenberg’s visit to the South Pole in 2011, however, Norwegians are keen to maintain presence on the continent. Sundtoft said that this week’s visit aimed to stress the importance of the Troll station’s research work. “Antarctica plays, along with the Arctic, a key role in the global climate system,” she told Aftenposten. Jan-Gunnar Winther of the Norwegian Polar Institute said the king’s interest in climate issues is important for polar research in Norway. “It’s a strong Norwegian signal when the king makes the priority to take time to travel all the way here when the government is in the midst of work on a report on Antarctica,” Winther said. The government is also grappling with climate issues in the run-up to the next UN climate summit in Paris later this year. The visit was set for two days, from Tuesday evening through Thursday, with a festive anniversary dinner Wednesday evening to celebrate Troll’s first decade as a facility operating year-round.